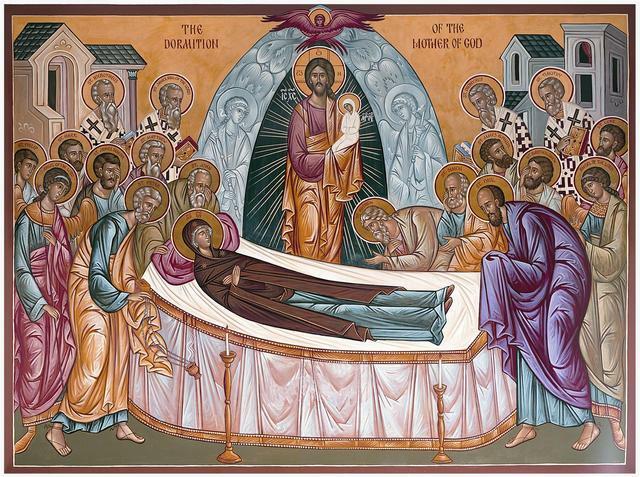 On August 15th the Orthodox Church observes the feast of the Dormition of Mary (Assumption in the Roman Catholic Church). The simple event of our Lady’s earthly death became adorned with all sorts of legendary additions which have never interested me. It’s the theological and mystical dimensions of this wonderful feast that interest me. Dormition comes after Transfiguration in the month of August. 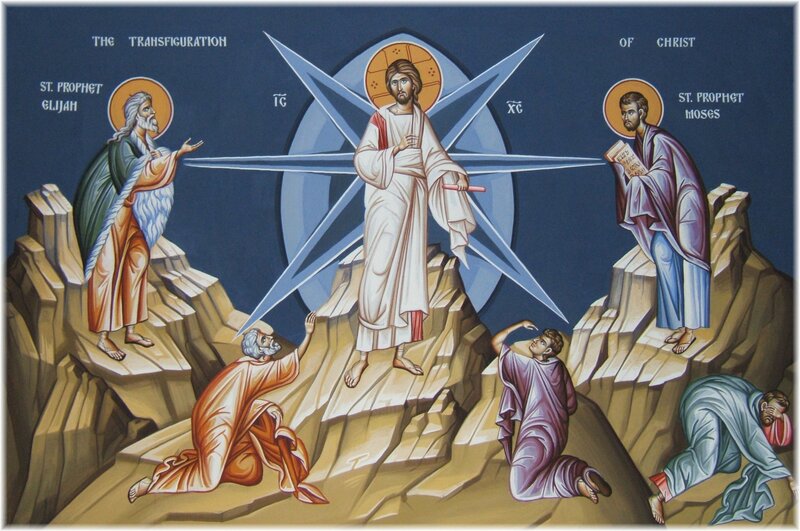 They go together in celebrating our entry into the divine glory – what is often called ‘deification’, though that term is open to much controversy and misunderstanding, hence my preference for ‘entry into divine glory.’ In the Transfiguration the divine glory radiates outward from the transfigured form of the Lord, sanctifying creation and humanity. 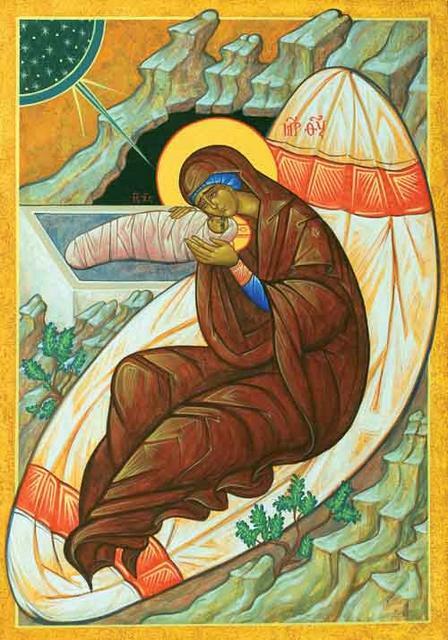 In the Dormition, Mary enters into the divine glory, she is no longer external to it. Mary enters into the divine glory as a newborn babe, wrapped in swaddling cloths. In the icon of the Nativity of Christ (Christmas), the infant Jesus is wrapped in swaddling cloths. In the Nativity, Mary wrapped her infant Jesus in swaddling cloths. 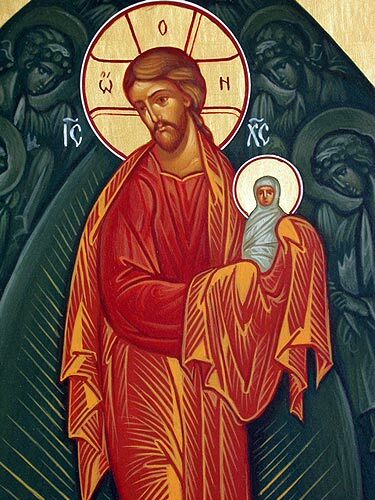 In the Dormition, Jesus holds the spirit of Mary in swaddling cloths. In iconic form, the son becomes the mother! 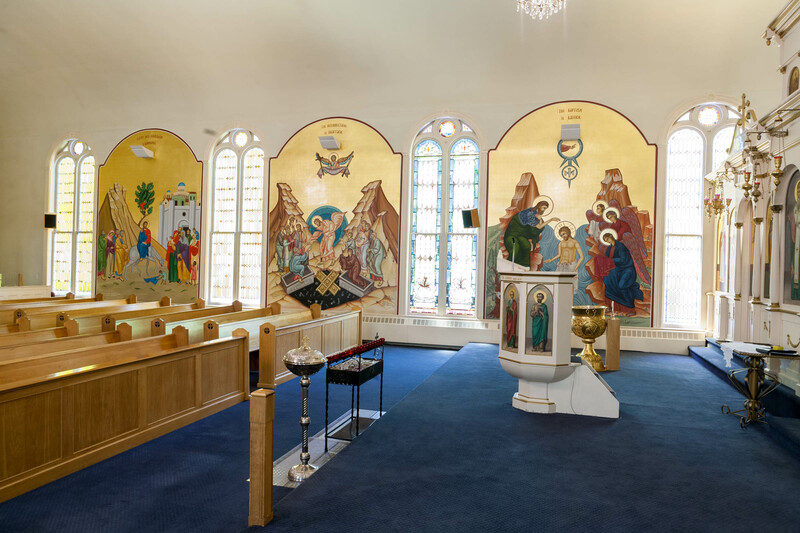 We have the Entrance of the Theotokos into the Temple in Jerusalem as a young child (not shown in the photo above), then the Entrance of Christ into Jerusalem, The Resurrection and the Baptism. At the Baptism, Jesus entered into the created order and the human experience. At the Entrance into Jerusalem, Jesus entered into the city where he would die on the Cross. In the Resurrection icon, we see Jesus entering the realm of death to destroy the power of death. These are all key events in the process of Jesus entering into our world and existence. They are events that make up salvation history in the Christian understanding. 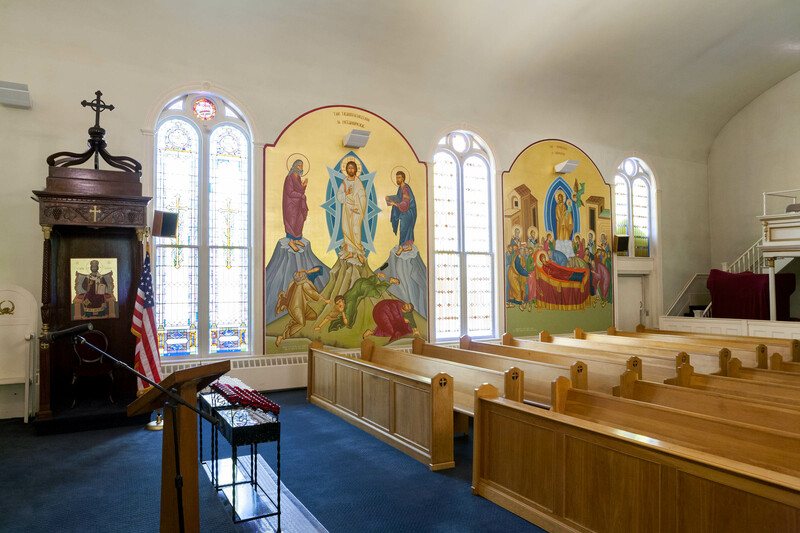 The south wall of our church contains just two large wall icons, and these complete the main iconographic scheme in our church. Here we have the Transfiguration of Christ and the Dormition of Mary side by side. Not only do they fall on the same month, August, within a week of each other, but they also complete the theme of entrance. The ultimate goal of the Christian life is to enter into the divine glory – not to become God, but to be brought into the divine life. Jesus entered our existence so we could enter the divine existence. Our iconography is uniquely gifted to represent these mirror aspects of salvation: Mary held Jesus in swaddling cloths; Jesus holds Mary in swaddling cloths. Jesus entered human existence; we enter divine existence. 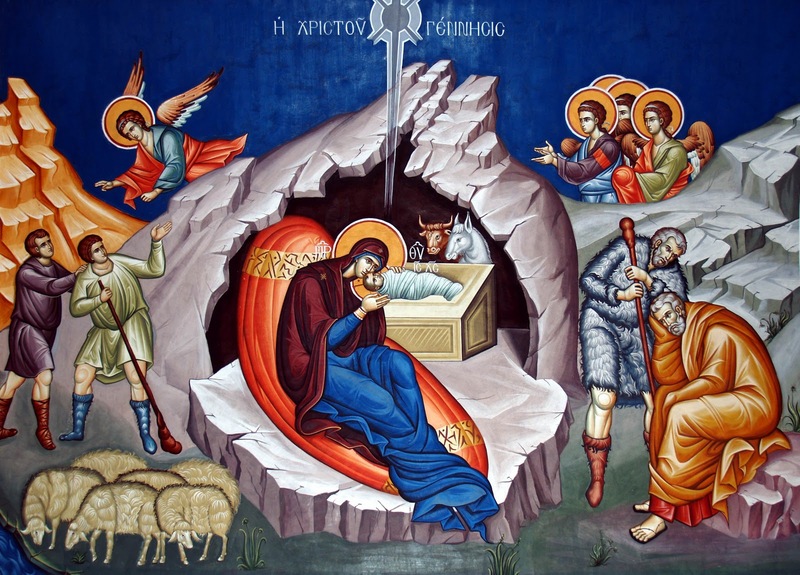 Many of the so-called Fathers of the Church spoke of Christ being born in us. Jesus was born of Mary physically. He is to be born in each of us spiritually. And he will receive each of us into divine glory, just as he received his mother: as a newborn babe, wrapped in swaddling cloths. “Naked I came from my mother’s womb, and naked shall I return there; the Lord gave, and the Lord has taken away; blessed be the name of the Lord,” said Job in the midst of his trials (Job 1:21). Except we don’t quite return naked to the Lord; we return in swaddling cloths, like infants. As infants we enter the divine glory. Jesus himself said: “Truly I tell you, unless you change and become like children, you will never enter the kingdom of heaven. Whoever becomes humble like this child is the greatest in the kingdom of heaven.” (Matthew 18:3-4) It seems the good news of Jesus Christ always involves a birth! Categories: Sermons, Theology in Icons | Tags: divine glory, Dormition in the Orthodox Church, new birth, Transfiguration | Permalink.